I haven’t made these eye catching little treats in a while but whenever I do, the kids (any kids, both big and small) absolutely love them! Not only ‘cos they’re a little confused as to whether they’re actually getting an ice-cream or a cupcake, but they can hear something secret hidden away inside. They’re also great to theme as just by changing the decorations and colour of the icing, you can use the same idea again and again and again. I have to admit though that they can become a little tedious and fiddly, but the reaction you get is well worth any extra time spent on colouring the batter. You see, inside each cupcake is a rainbow of pure joy! Now don’t get too impressed by my cleverness because it isn’t really very clever at all – once you’ve completed making the batter, simply spoon it equally into separate bowls and add a drop or two of colour – seriously, only a drop or two as a little colour goes a long way. Once all the batter is coloured, carefully layer it spoon by spoon into your cupcake/muffin cases. And please Please PLEASE remember the golden rule of making cupcakes: Always put the cases into the muffin trays before you begin filling them! It’s best to do this as the first step when making cupcakes as I have a couple of friends who have forgotten to do this and then battled to get the cupcakes out, or they’ve placed the empty cases onto a flat baking tray in the hope that the cakes will hold their shape, but be warned – they won’t! The batter oozes out everywhere and you end up with a disappointing mess. Now, back to these adorable creations. Some people bake inside the ice cream cones but I haven’t tried that, and to be honest, I probably won’t. Also make sure that the cupcake base matches the size of the opening at the top of the ice cream cone before you begin. You want a fairly tight fit, but not so tight that the pressure begins to crack the cone’s edges. While the cupcakes are baking, you can make your icing as normal. I use butter icing and again, you can colour this however you please. Here I chose Strawberry and Chocolate “ice-creams” which worked well – please excuse the photos, as I said, I haven’t made these in a while and came across these pics while looking for inspiration the other day. I find that flat bottom cones work best as they happily stand on their own, like rows of little soldiers so hunt around to find them, I promise they are far less frustrating than the traditional cones unless of course you have a “cone holder” stashed away at home that you can use. 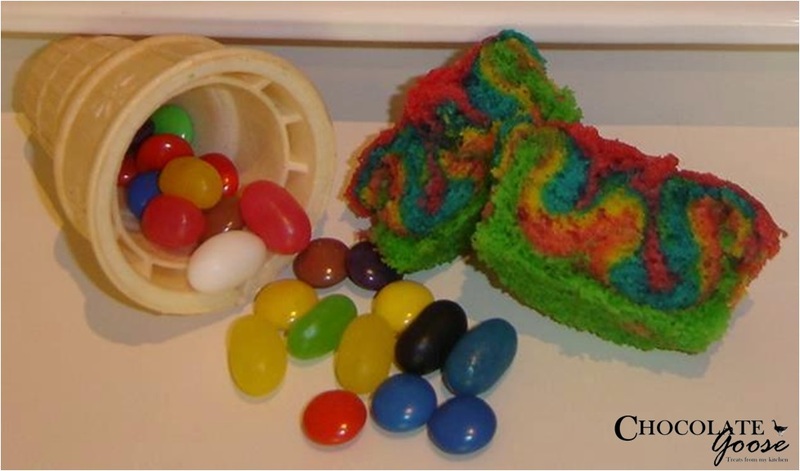 Once the baked cupcakes have cooled and the icing is ready, line everything up in a conveyor belt type operation and begin by adding a few lollies/candy to the cones. 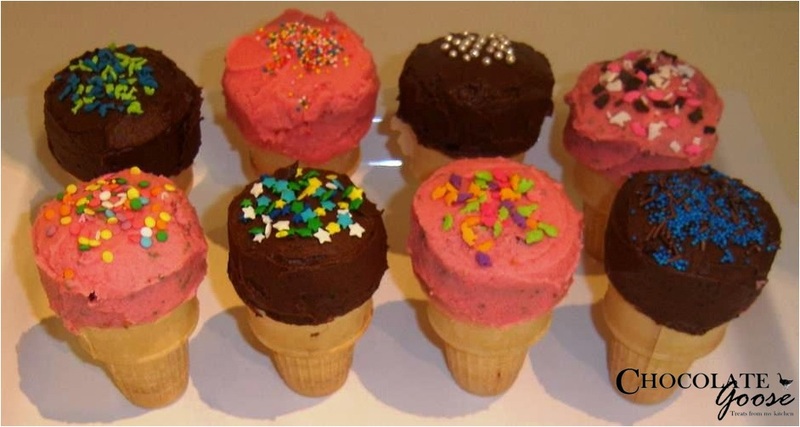 Then fit the un-iced cupcake to the cone and ice as normal, but be careful as you don’t want to dislodge the cupcake. I’ve found that little fingers are always willing to help decorate with sprinkles or more candy but some advice from me? Serve them outside as they can be almost as messy as real ice-creams. Below I haven’t listed the ingredients for the cupcake batter or the butter icing, but you can use your own. I have hundreds of these recipes and am experimenting with which I like best so will add in a future post. This post is really just to give you an idea of how to put it altogether and lists a few things you’ll need to have on hand to begin constructing. Preheat your oven to the desired temperature and add the muffin/cupcake cases to the muffin/cupcake trays. Prepare the batter as per your recipe and separate into individual bowls. Colour with a drop or two of food colouring being careful not to contaminate/mix colours. Using two spoons, carefully layer the batter into the cupcake/muffin cases. Bake as per the recipe and remove from the oven once done. Transfer to a cooling rack and allow to cool completely. Prepare the butter icing as per your recipe and separate into individual bowls. Colour with a drop or two of food colouring being careful not to contaminate/mix colours. Stand the flat-bottomed cones and add a few lollies/candy to each. Insert the un-iced cupcake until secure and then ice. Decorate with the remaining lollies/candy/sprinkles.